Front-line police officers, paramedics, firefighters and security personnel continue to rely almost exclusively on land mobile radios (LMRs) to get real-time information from their commanders and field support groups. In-vehicle mobile computing has been a big step forward in connecting field personnel back to their critical data systems, locating them through Automated Vehicle Location (AVL), and enabling reporting to be done more efficiently in the field rather than returning to their desk. But what happens when there is an emergency and the responder needs to step out of their vehicle, chase a suspect or enter a high risk area? And what about those responders who don’t use a vehicle at all (e.g. 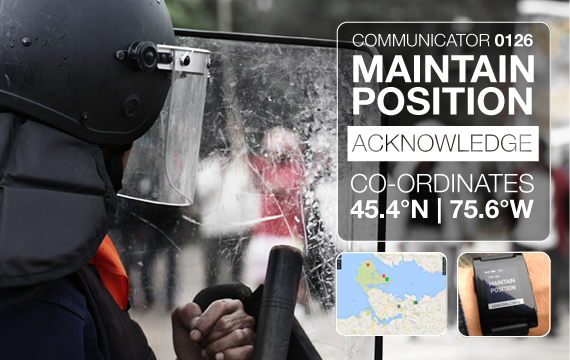 bike or foot patrol, mounted squad, school resource positions, covert teams) or lone workers? They are limited to voice only LMR systems and lose the ability to stay connected, protected and situationally aware at all times. The result is increased risk to their personal safety and a lack of command and control in dangerous situations. CommandWear has conducted over twenty operational field deployments of wearable technology with various law enforcement, fire/paramedic and corporate safety organizations. Responders wore smartwatches from Samsung (Gear S3), Motorola (Moto360), Huawei (Watch 2), Pebble and Apple. Smartwatches were Bluetooth tethered to an iOS or Android smartphone used for GPS location tracking and communications via LTE and Wi-Fi networks. 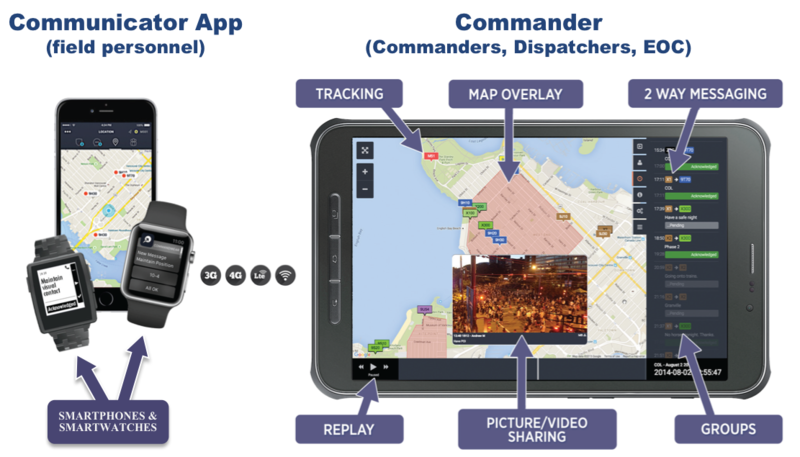 The smartwatches and smartphones were running the CommandWear mobile situational awareness apps and connected to a secure cloud server. Commander and operations center staff used desktop and tablet PC’s to access the CommandWear web app in order to track locations and status of field staff, view and share pictures/video, securely communicate and replay a historical log of events. CONVENIENCE: Most mobile teams preferred the smartwatch over a smartphone for basic communications, especially those needing to remain hands free (e.g. bike teams) and covert. COST: Smart devices with Push-to-talk over IP and rich text messaging functions have opportunity to replace expensive radio systems and devices. FirstNet and other Public Safety Broadband initiatives will accelerate this trend. COMMUNICATION: Radio traffic was significantly reduced due to use of text messaging to the smartwatch and GPS tracking via the smartphone app. Sensitive information not suitable for radio broadcast could be directed to specific individuals or groups, as needed. Messages were acknowledged by pushing a button so Command/Ops Centre staff knew the message was received and read. SAFETY: Safety was enhanced through location tracking, panic button and heart rate monitoring and alerting features. Remotely turning on video/audio streaming from the Responder’s mobile device was also considered important when a responder had not checked-in and was un-reachable by radio. AWARENESS: Situational awareness was enhanced through picture/video sharing, including on-demand video streaming from smartphones. RESPONSE: Speed and accuracy of an emergency response was improved through knowing exactly where field personnel were located (e.g. who’s closest and in position). FORM FACTOR: Smartwatches enhance operational effectiveness and safety in police, covert, confined space, and high angle rescue operations. In situations requiring heavy clothing, such as public order, the vibration on wrist to indicate critical messages/commands, plus use of heart rate monitoring/alerting capabilities of the smartwatch app were considered useful since phones couldn’t be used. INTEROPERABILITY: A seamless integration of team data was shared across systems, such as dispatch and AVL, through CommandWear’s open Application Programming Interface (API). This gave command and dispatch a “one pane view” of all assets and allowed multiple agencies to work from a common operating picture. DATA SECURITY: A mobile data management (MDM) solution should be considered to enhance security and ease management of apps running on all mobile and wearable devices (e.g. simplifying the software update process; remotely wiping the app and data if the device is stolen or lost; or limiting internet surfing or access to other non-critical apps on the device). In the high-risk public safety sector, officials are constantly trying to find new ways to increase safety for police officers. However, procurement policies and processes often don’t permit testing new technology – or at least not in a timely manner. CommandWear offers organizations access to these new mobile and wearable technologies through turn-key pilot kits. Contact us for more information. Mobile and wearable technologies are advancing quickly and most agencies we’ve surveyed tell us they are challenged to try and catch-up. The good news is that new mobile devices are becoming more capable, durable, connected, secure and affordable. The use cases for wearable technology in the enterprise are becoming clear as more agencies try it out. For example, sensors onboard smartwatches can be used in smart, practical ways to simplify field workers’ jobs and increase safety. A motionless worker with very low heart rate may trigger an alert to a monitoring center showing their exact location. If the worker is not responding, their smartphone/smartwatch camera and microphone could also be opened to give remote support teams an ability to see and hear what is happening. The GPS sensor on these devices also gives teams immediate insight into who is closest to help out. This capability may sound a bit futuristic, but the reality is it is being used today. Many agencies are hampered from testing this new technology due to concerns with privacy, security and reliability. These legitimate concerns became the driving force behind development of the CommandWear platform. All data and communications are encrypted, no personal or sensitive information is stored on devices, and we continue to design and develop software that runs on customers’ existing devices and interfaces with existing systems. As mentioned, mobile data management (MDM) technology should be seriously considered to further secure and manage all mobile and wearable devices. CommandWear Systems Inc. is an innovator of situational awareness information systems that transform the way individuals track, communicate, and respond with their team in any situation. The goal is to save lives while improving operational efficiencies. Launched in 2013 by a public safety technology veteran, CommandWear has won several innovation awards and was one of ten companies invited to participate in the Department of Homeland Security’s technology acceleration program (EMERGE). For more details or additional Case Studies, please email us at info@commandwear.com or contact us online.